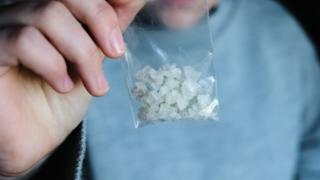 "Aggressive marketing" by drug dealers who send out targeted text messages and give free samples could be one of the reasons for a rise in crack cocaine use in England, researchers have said. The drug is reported to have become more commonly used by students, clubbers and professionals. Government research said there may now be "less stigma" about the highly-addictive form of cocaine. "Less capacity" by police to target dealers was also said to be an issue. The study, published by the Home Office and Public Health England, set out to examine the reasons for a "statistically significant" estimated increase in crack cocaine users, from 166,640 in 2011 to 180,748 in 2017, a rise of 8.5%. The study drew on knowledge from drug treatment workers, crack users and police officers in six local authority areas where there had been large increases in the number of people starting treatment. The findings back up figures which suggest the upward trend began to develop after a surge in the global production of cocaine in 2013. Crack - cocaine processed into a rock or lump form - can be smoked or mixed with liquid to be injected. Encouraging greater dependency on crack was more lucrative for dealers, the study said. Dealers were reported to be sending out messages with "special offers" or "deal of the day" and containing "buzzwords" such as "magic" and "power" to "trigger cravings". Some users reported crack was being made available in smaller quantities, with one referring to "pocket money prices", such as £5 per rock. The report said organised crime groups took advantage of excess supply to push crack cocaine onto a captive market of entrenched heroin users and groups of new users. Treatment workers said crack was "beginning to become more acceptable, even fashionable among groups who would not previously have taken it". They suggested dealers marketing it as "smokable cocaine" might be a factor. The report added: "In one area with a large university student population, there was a view that dealers were successfully infiltrating these groups." One person receiving treatment told researchers her 17-year-old daughter and her friends were taking crack at parties, while another commented: "Kids are using it. They think that crack is not as serious as heroin - it's not a dirty drug." In three of the areas of the study, there was evidence of "out of town" dealers from gangs in London, Liverpool, Manchester and Birmingham infiltrating local markets. Police in two of the areas said they had not noticed any changes in crack use and in one area said young people tended to avoid it because it had a "negative perception". But some officers told researchers their forces no longer had dedicated drugs squads or said a "lack of capacity made it difficult to prioritise drug-dealing". Rosanna O'Connor, director for drugs, alcohol, tobacco and justice at Public Health England said: "More needs to be done to improve the links from the criminal justice system into treatment services." Home Office minister for crime Victoria Atkins said: "The government is committed to tackling the illicit drugs trade, protecting the most vulnerable and helping those with a drug dependency to recover."